Despite its dramatic-sounding conclusions, UK research into the “sub-lethal effects” of cats reveals very little about real-world predator-prey dynamics or their potential impact on bird populations. 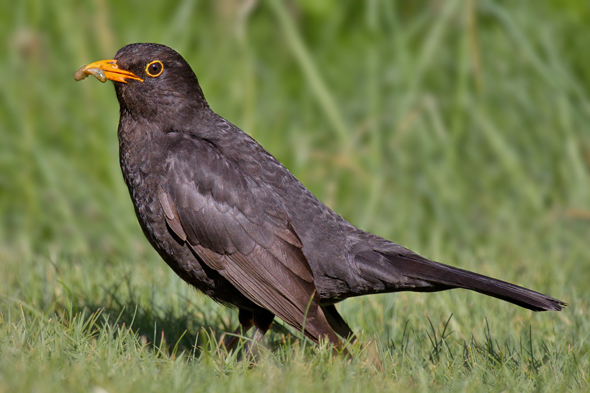 Common blackbird. Photo courtesy of Wikimedia Commons and Andreas Trepte. Models were placed on the ground, approximately six feet away from the location of each blackbird nest (each of which was 0.8–6.6 ft. off the ground) during one of three stages of chick development: egg, young chick (1–4 days), or old chick (over 8 days). In each case, all three models were presented, in random order, over a three-day period. Each model presentation lasted 15 minutes, with a 24-hour interval between presentations. During 2010, researchers studied a total of 47 nests (17 at the egg stage, 15 at the young chick, and 15 at the old chick stage); in 2011, they studied 49 nests (20 at the egg stage, 15 at the young chick, and 14 at the old chick stage). During each model presentation, the researchers recorded parental behavior “from a concealed location [49–98 feet] away, paying particular attention to alarm calling and aggressive behavior (e.g., “striking, diving towards or hovering within [6.6 ft.] of it”). Following the model’s removal, “provisioning visits” were observed for an additional 45–60 minutes. “We conducted controlled model presentation experiments at active urban blackbird nests to provide the first empirical evidence that quantifies the potential sub-lethal and indirect effects of predators (domestic cat and grey squirrel) on avian reproductive success. Is ABC really suggesting that dead cats are “devastating populations of birds and other wildlife”? After all, we’re talking about taxidermy mounts here. Correction: one taxidermy mount of a domestic cat. Not that I considered the work to be particularly rigorous before I learned of this detail (one ABC either didn’t look into or didn’t feel important enough to publicize). As I explained to Evans, I think the study’s highly questionable design precludes the sort of conclusions he and his co-authors (and ABC) make. My objection is based largely on two key factors: (1) the artificial nature of the investigation, and (2) its brief duration. The conclusions being drawn here assume that the blackbirds actually interpreted the “model cats” as if they were live cats—and therefore, that their behaviors accurately reflect the real-world behaviors of urban blackbirds in the presence of cats. Which strikes me as highly implausible—in part because it’s difficult to imagine any cat remaining stone-still for 15 minutes** just a few meters away from a blackbird nest, especially once the parents have become so active. However, such work can be used—as ABC has once again demonstrated—to fuel the long-standing witch-hunt against free-roaming cats. Although researchers are in no position to prevent their work from being co-opted in this way, they can certainly foresee the likelihood—and they therefore have an additional responsibility to produce only the most rigorous work and present only the strongest evidence. Bonnington et al. simply didn’t fulfill that responsibility. ** Evans and his co-authors, referring to the work of Thomas Schaefer, suggest that this “is within the time range during which mammalian predators typically remain within the vicinity of birds’ nests,” But Schaefer was referring specifically to the time taken “to eat the nest contents.”  And although Schaefer did find that “mammals took significantly longer to eat the nest contents” than did avian predators, which “usually stayed just a few seconds at the nest to remove eggs or young,” it seems smaller mammals (e.g., mice) stayed longer than did larger mammals (e.g., martens).